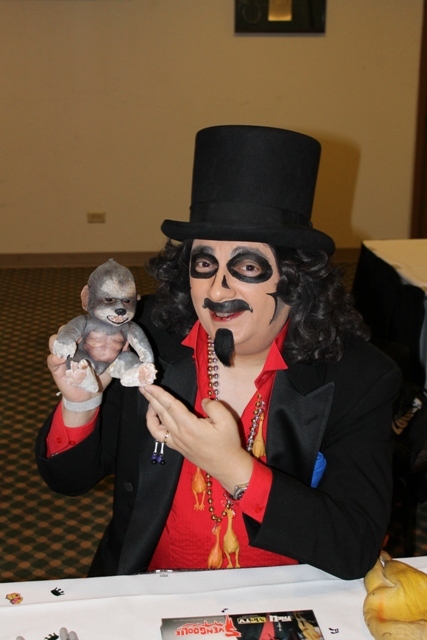 A Day at the Races…with Horror Host Svengoolie! 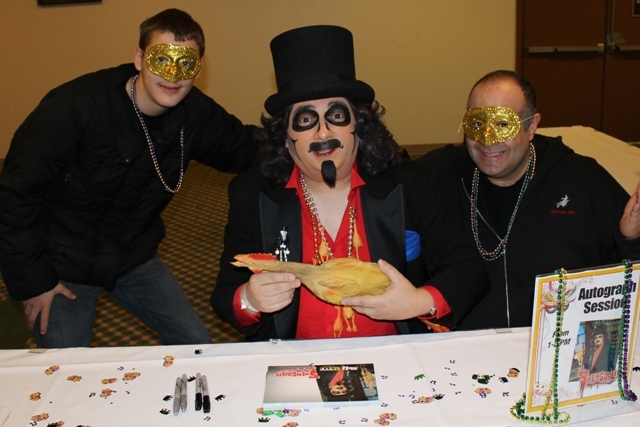 This past Saturday, the FIRST major Svengoolie appearance of 2012 was “out of the gate!” Yes, I’m one of those lucky fans from Chicago who not only is able to STILL enjoy his childhood host as an adult, but saw him proliferate this past year by going national. Since TERROR FROM BEYOND THE DAVES is a horror host friendly site, created by two childhood fans of Sven, its become a great excuse to stalk the man’s appearances without raising two many eyebrows (except on Facebook where I seem to get called out on it all the time). 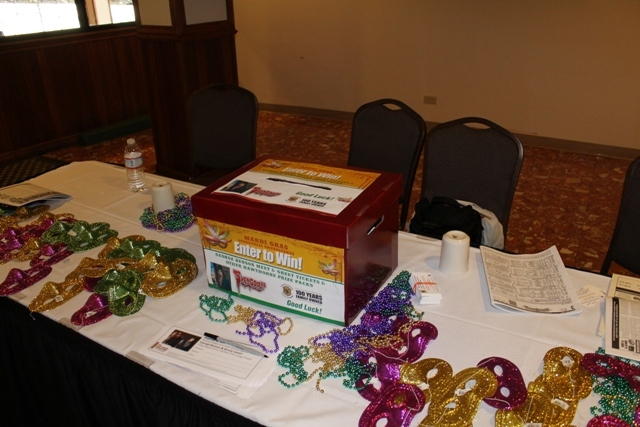 This appearance was in celebration of The Hawthorne Racetrack’s Opening Day and had a Mardi Gras theme. Despite getting a raised eyebrow from his mother when I announced we were going to the racetracks, I decided to bring my 14 year old son, Alex, along for the trip. Alex has watched Sven with me his entire formative years and, like many Chicago kids, even dressed up as him one year for Halloween. I’ve never been to the tracks before and am really not the gambling sort. As you’ll soon learn, this would have been a great day to have started! We arrived about 30 minutes before Sven did and were directed to the area where he would be signing autographs. To the left of the line was a table offering “Mardi Gras” style masks and beads to wear and, to the right,was the table where Sven would be signing. As we entered, I noticed a couple of familiar faces right in front of us. It was fellow “super fans” Don & Angela Urban. If there are any Sven viewers out there who may not recognize the name, you would certainly recognize Angela’s work. She is known for making her favorite host, hand-crafted items – most recently a “Svengoolie mailbox” that you can still see sitting on his desk during current mail segments. Soon the Count & Countess Gregula also arrived and, minus Jamie Lee Cortese showing up, Svengoolie’s official “cheer squad” was all accounted for. Svengoolie arrived soon after with his assistant, Jim Roche. Last October David and I purchased three Werepuppies from Asia Eriksen of Fable Foundry (see story HERE) and wanted to give one to Sven as a “thanks.” This was back in October when we were thrilled to hear that the weekend before Halloween Sven would be highlighting the Scary Monsters Magazine articles we had written about him. As the film he was presenting was CURSE OF THE WEREWOLF, we thought it was a perfect choice, not only on account of that but for all the other great classic werewolf films Svengoolie has returned to commercial TV. I had held on to it and decided to bring it to him for this appearance. He seemed to really like it and we hope, like Anegla’s mailbox, it will find a nice home on his set! Another fan who caught might attention was a man named Carlos Reyes. Mr. Reyes brought a photo he’d taken of his nine year old son “back in the day” standing next to the Son of Svengoolie (as Rich Koz’s Svengoolie was called at that time). 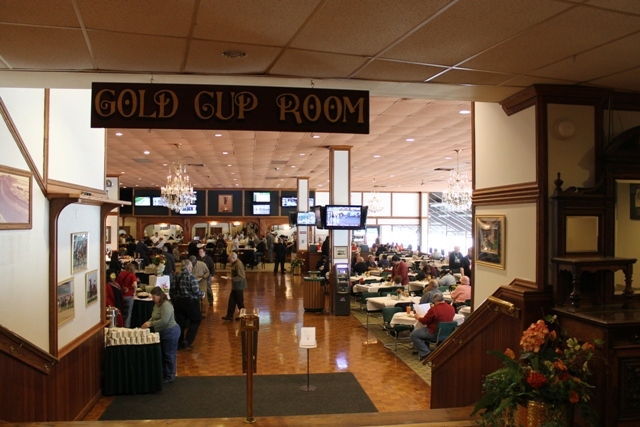 After the signing was over, we followed Sven into The Gold Cup Room (buffet lounge and betting area) where he would give his picks for three subsequent races. This would lead us to the portion of his appearance that has haunted me ever since. Svengoolie named all the horses featured in their respective races, gave who the favored was to win, and then named a different horse (usually based on its name as he would humorously explain) as his pick for winner. In ALL THREE races, Svengoolie picked the winners! Prior to this, I had debated betting on Sven’s horses in effort to make it more fun, but opted not to in lieu of my really not wanting to lose any precious gas money. Needless to say, I have been horse-kicking myself ever since!!! It was a long day and I was tired after being up late the night before (due to some other “Terror Daves” business I’ll be blogging about next time). Hawthorne Racetrack would later confirm that it was a stellar opening day for them and that Svengoolie is always a sure-fire way to attract big numbers! 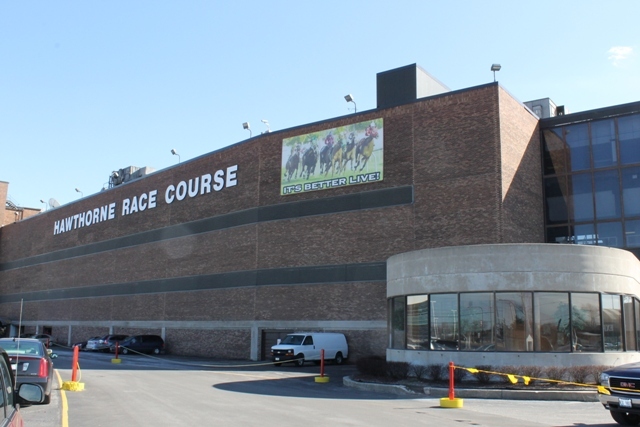 Despite my wife’s trepidation, families are most welcome here and its a lot of fun whether you decide to bet or not. Although it’s February, it was beautiful & sunny and a GREAT way to kick off another year of Svengoolie appearances! NOTE: Any Svengoolie fans reading this post before April 1st, 2012 can vote for Svengoolie as “Best Horror Host of 2011” in this year’s Rondo’s. Simply send an email to taraco@aol.com, type “Rondo Awards” in the subject and then put in the body #20 – Svengoolie along with your name. If you are feeling REALLY nice, you can also write in the same message, #18 – Terror from Beyond the Daves for Best Blog. We’d sure appreciate it! This entry was posted in Horror Hosts, Stalking Svengoolie! and tagged Hawthorne Racetracks, Son of Svengoolie, Svengoolie. Bookmark the permalink. ← “My Bloody Valentine”…Less Cut means more Cutting!